Midweek or weekends breaks available. A deposit of £100.00 is payable to secure booking/ and hold as as security Bond. 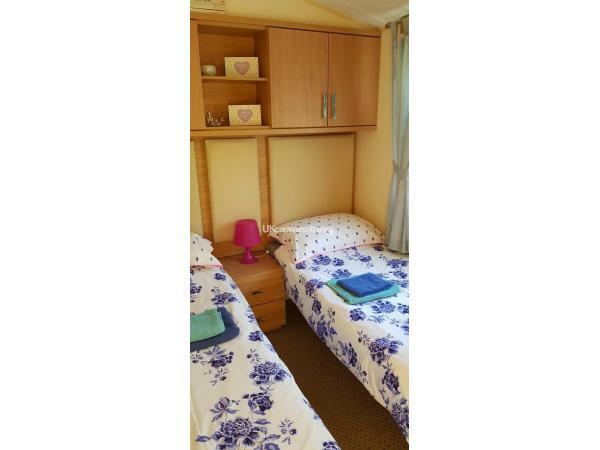 This will be required when booking and then refunded within 14 days after check-out, providing the caravan is left clean and tidy as you found it and there is no loss or breakages. Any damage or loss will be expected to be paid for, as per booking terms and conditions. All Cleaning materials are in the caravan and a Hoover. Little extras provided. Full payment is required 4 weeks before the holiday. If booking is made within 4 weeks of the commencement of the holiday, then full amount is payable at time of booking. If booking is cancelled within 5 weeks of the start of the holiday, then the full deposit will be forfeited. The Caravan pricing starts from £395 low season too £600 High season, i am very flexible with dates, if you would like full weeks stay, part week or weekend i usually accommadate most requests. It has a great beer garden at the back of the Bar area safe for children to play and run about, with the children pirate ship a favourite, the Bar has free wifi, a small amusement area,and also children entertainment Room (Pebbles)in the evening disco upstairs in the complex next to the bowling Allay.. For the Adults the park has a cabaret lounge(.No children allowed). where weekend entertainment is always on plus Bingo, lovely relaxing cocktail terrace looking out over the sea and the sunset. 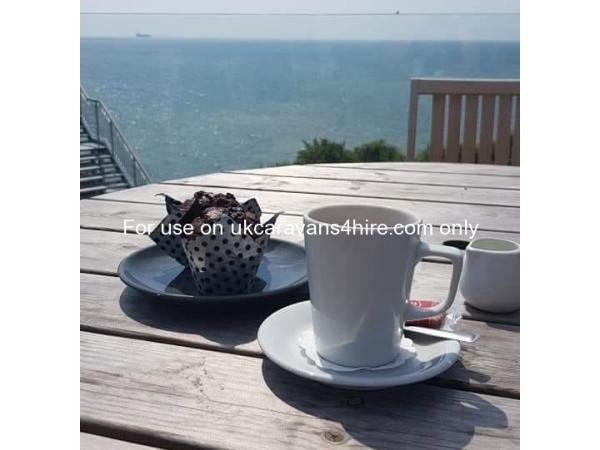 There is a award winning Indian Restaurant within a beautiful setting looking out to sea,also a very popular fish and chip shop,pizza/kabab place, also The shoreway are doing Fab Breakfasts,lunch Meals and Sunday lunches or just a coffee/tea and cake over looking a gorgeous view. If you feel you have over indulged a dip in the swimming pool or a session in the gym sauna etc is a good choice, but a small fee to be paid. per session.. Also gym facilities, try your hand at Bowling in the new 4 lane Alley. 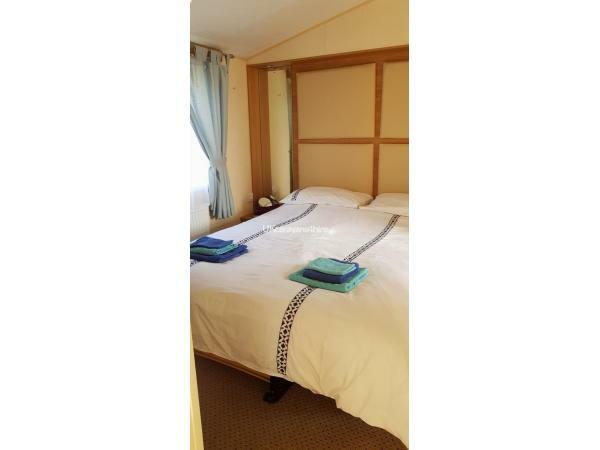 My caravan is a Modern "12ft width x 38ft long" 6 berth caravan with Double doors opening out on to the Decking it has 2 bedrooms, The double has a en suit toilet, with lots of storage space, the second bedroom 2 single beds, and spare fold away beds are within the living area. 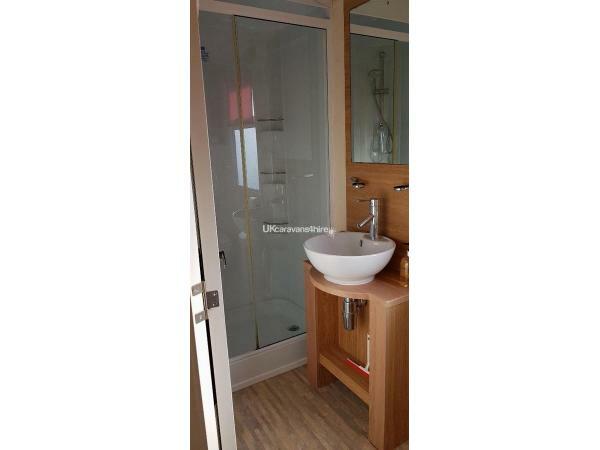 nice size bathroom Modern Bowel Sink with walk in shower. The living area is open plan with comfy corner sofa with electric recliner ends and USB ports, 40in flat screen tv on the wall, also have wifi in the caravan Which is FREE, so its all at your fingertips..
Outside is Ratten Furniture on the Decking also a picnic table parasol on the patio area. Arrival Times 2pm onwards ~ Departure By 10am.. I can be flexible and can be discussed at the time of Booking..
A booking deposit of £100 will be needed but will be refunded after you have left and everything is in order in the caravan. The Balance will be due to pay 4 weeks before your holiday date. We provide electric, gas, bed linen, hand towels, tea towels, hairdryer iron and board. 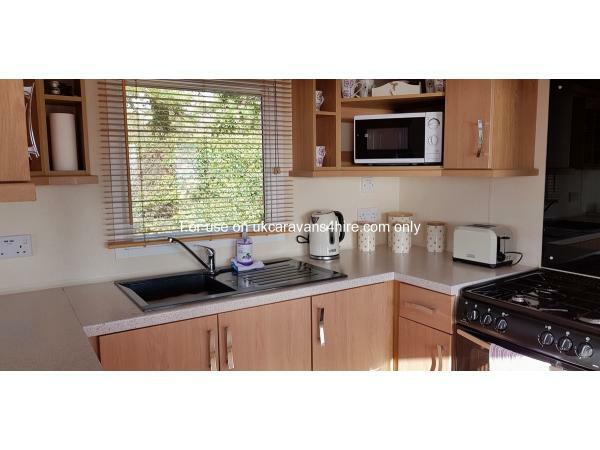 Also you will get the basics such as loo roll, and washing up liquid and condiments, cleaning materials rather than fill the car or have to bring everything.Please don't hesitate to Contact me for any more information about booking this lovely holiday caravan. Additional Info: Swimming pool fees £ -- per swim per person..